Towards the end of every year, FRSC releases their statistics on the number of fatalities in Nigeria resulting from road accidents. In 2015, FRSC stated that 5440 people died as a result of car crashes. This year however, that number increased to 6,000. Picture: Graph showing causes of fatalities in Nigeria based on a 2006-2013 study carried out by IFRA. 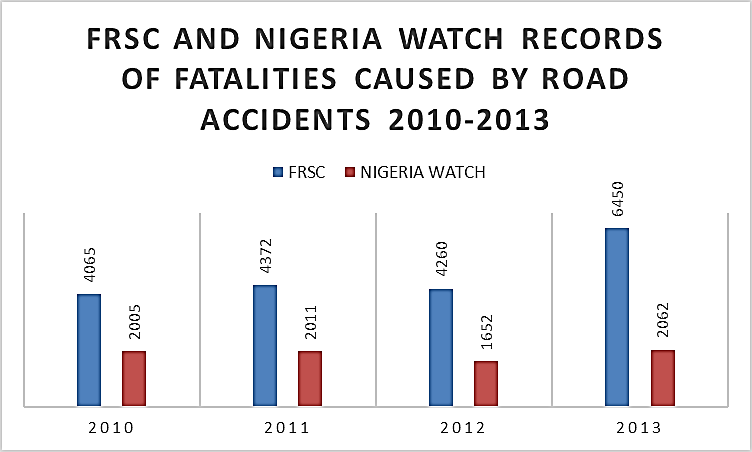 According to Nigeria Watch Database, Traffic accidents account for the most fatalities in Nigeria. Montclos, M.-A. P. (2016). Violence in Nigeria: A Qualitative and Quantitative Analysis. Ibadan: Africa Studies Centre. In Niger State, they recorded 361 road crashes from January to September 71 were fatal. In Ogun state, they reported 428 accidents between January to November. In Lagos state, they reported 2,401 road accidents from January to September. It is unclear how FRSC comes up with their figures but as the primary agency responsible for the collation of fatal and non-fatal accidents, we are reliant on whatever figures they provide. Once the FRSC Annual report on 2016 is released, we will conduct a report highlighting most dangerous states, highways and roads across Nigeria. 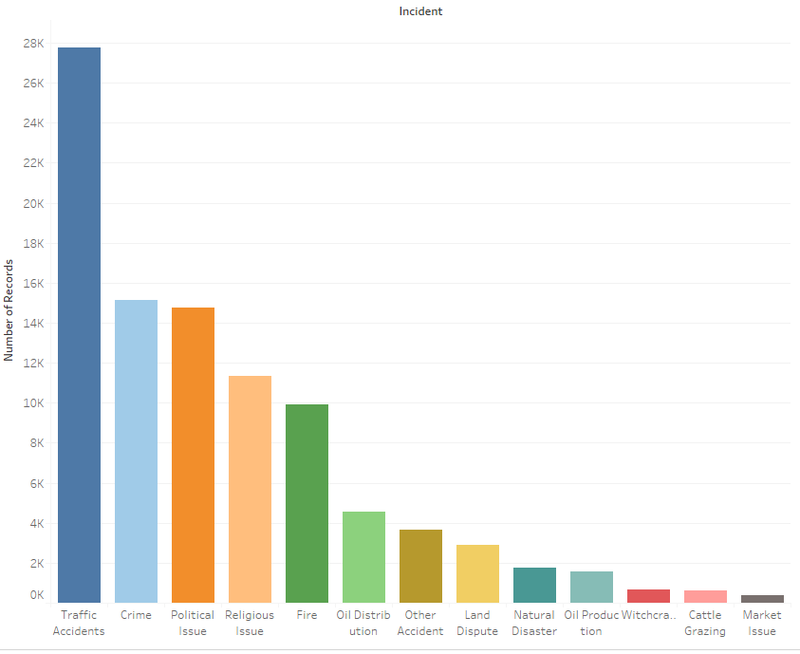 This graph is from the Nigeria Watch database which tracks accidents involving fatalities from primarily open source data. If only open source (news media) reports on road accidents were used, the number discrepancy is significant. Over the Christmas reporting period, Bulwark Intelligence analysts noticed constant reports of road accidents being reported. FRSC later confirmed that it had recorded 289 crashes and 187 deaths during the Christmas Holidays celebrations. The main cause of accident FRSC typically cites is over speeding. Officials stated that in Nigeria, “speeding accounts for over 60 per cent of accidents we have on our roads today”. Evidence of this can be seen in most road accident cases which are caused by head-on collisions. Impatient drivers try to overtake slower vehicles during blind spots, or miscalculate their ability to overtake, leading to instant collision. FRSC however, does not take into account those who have been driving under the influence. Recent reports indicate that drug use is on the rise across Nigeria. In 2014, Lagos State government statistics revealed that 50% of Lagos bus drivers used illegal drugs. The researchers involved went to a commercial motor park and tested 801 drivers, 442 of which tested positive for illicit drugs such as cocaine, morphine, opiate, ketamine and marijuana, out of 801 tested. Out of the 442 commercial bus drivers tested for the use of hard drugs, 74 of them were at the moment, found to be under the influence of cocaine, marijuana and others. FRSC continues to attempt implementing safety precautions for vehicles. Some of the recent precautions taken include the introduction of speed limiting devises for commercial vehicles and the ban on petrol tanker night journeys. The deadline for installation of the speed limiting devices were initially set for October 1st 2016. This date has been pushed back twice, with the new enforcement date set for February 1st, 2017. What typically happens as with most other road safety laws in Nigeria, is there will still be general population non-compliance coupled with the inability of FRSC to enforce compliance. Year after year, the same Federal and state roads and highways report high numbers of car crashes, but few “Government Sponsored” safety measures such as traffic lights, street lamps, warning signs, prevention of decaying vehicles from plying the road and so on, are put in place by the government to prevent them. Most safety programs the government will enact and enforce are the ones in which private citizens will have to fund and install themselves (case in point are the speed limiting devices). With the bad economy, the Federal Government will have a hard time funding any new programs for law enforcement agencies in 2017. This will lead to little to no changes in road accident levels across the country. Worn out tyres are one of the main causes of accidents in Nigeria. As such it is recommended that tyres be replaced every 80,000km. Tyres should not be used past its 4 year life span. Under inflation and over inflation of tyres lead to fatal accidents when. Ensure tyres are inflated according to the manufacturers specification. 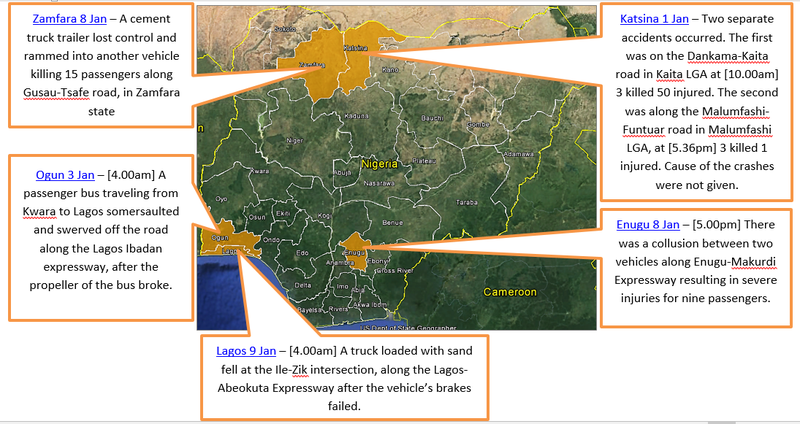 Most traffic accidents in Nigeria occur at dawn. This is as a result of low visibility due to poor lighting as well as driver fatigue (both for drivers who have been on the road all night, or just waking up to begin their journey). It is therefore recommended that road travel take place during daylight hours. Several roads and highways have really bad portions of the road which if hit while on high speed could lead to loss of vehicle control Therefore Limit speeding on the roads, especially while plying unfamiliar routes. While bad roads are a known cause of accidents in Nigeria, good roads have also been identified as a major cause of accidents, due to “driver excitement”. Drivers who are not used to smooth roads tend to get overly excited and attempt to test the limits of their vehicles. It is important to follow traffic laws, maintain speed limits, and be on the lookout for and carefully avoid “over excited” drivers.